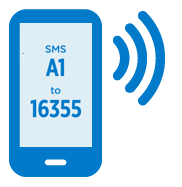 In Helsinki, you can order a single ticket by SMS to your mobile phone. SMS tickets are valid on trams, the Metro, Suomenlinna ferry, commuter trains within Helsinki as well as on eastern Metro feeder routes 57, 80-99 (also A, K, B, V but not on routes 90A and 91 or N services), West Metro feeder routes 20 and 21 and on trunk route 560 within Helsinki. The ticket is valid for one hour from the moment of purchase. Alternatively, you can download the HSL Mobile ticket app to your smartphone and use it to buy mobile tickets valid on all modes of transport. Mobile tickets are available for all HSL travel zones. Read more here. To order an SMS ticket, send an SMS "A1" to 16355. You can type the order code "A1" with or without a space. You will receive a single ticket that is valid for one hour from the moment of purchase in a reply message. The message shows the validity time and zone of the ticket, an identification number and the sender number. The service is available with the subscriptions of Elisa, Kolumbus, Saunalahti, Sonera, Tele Finland and DNA (+ Dicame, TDC, Cubio, Academica, Aina -prepaid). The price of the ticket will be included in your phone bill. In case of prepaid subscriptions, if the purchase amount exceeds the available balance, the purchase will be denied. The SMS ticket must be on your mobile phone before you enter a vehicle or the Metro platform area. Remember to check that you have received the ticket before boarding a train, tram, bus or ferry, or entering the Metro platform area. Please note that you enter the Metro platform area when you get on the escalator after having passed the Travel Card readers. The beginning of the platform area is marked with a yellow line. If you order or receive the SMS ticket when you are already on a vehicle or in the Metro platform area, you may be issued with a penalty fare. You can also order an SMS ticket in advance. In this case, the ticket will be valid from the moment you want. To order the ticket, send an SMS “A1 [space] hhmm” to 16355. For example: A1 1300. The time must be entered in the 24-hour format (hours first, then minutes), without a space. Hours must be between 00 and 23, minutes between 00 and 59 with the exception of midnight which can be expressed as 0000 or 2400.